Looking for a one of a kind dress for a very special occasion? Created by one of the most famous Canadian and worldwide designers in the bridal industry, Alfred Sung With an experience that spans over a few decades, Sung breathes life into his creations in a simple, yet utterly sophisticated way. As part of The Dessy Group, Alfred Sung's creations show devotement for flawlessness, both in terms of cuts and in terms of the materials used to make every dress. Made from the best quality materials, this design was created to make women feel absolutely stunning for all kinds of special occasions. Ideal for all body shapes and sizes - this dress is available in sizes 00 to 20. It flatters all shapes and sizes, from petite to tall, or plus sized women. Available in the most popular colors, all of which are extremely trendy and can be coordinated with a wide range of wedding color schemes - including the ones that are based on Pantone's Color of the Year. Even more, this dress design is also available in white and ivory, making it a splendid, affordable choice for brides themselves as well. After all, what could be more flattering and sumptuous than a well- made, luxurious wedding dress? 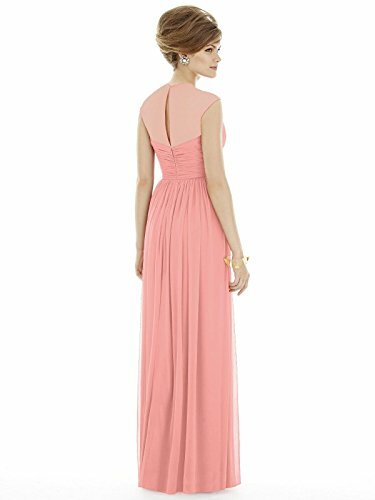 Extremely polished and this evening dress will make any lady feel like a true royalty as she wears it - you will be no exception from the rule. From the cut of the skirt to the flattering silhouette, everything about this dress is chic yet timelessly stylish. This dress is so beautifully designed that ladies won't even need any other accessories to make it truly pop with uniqueness and grace! 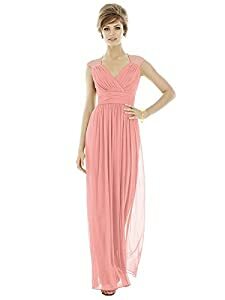 ELEGANT CHIFFON BRIDESMAID DRESS - Wispy and sheer, this dress has a silky soft finish that gives a unique effortlessly flawless look. A long- time favorite for evening and day wear. CLASSIC DRAPED V- NECK - A modern take on a timeless look, the surplice v neckline gives a romantic look and feel for any occasion. FULL LENGTH SHIRRED SKIRT - Cinched at the smallest part of the waist and flared out at the hips, the long and flowy skirt adds a graceful elegance, making any woman feel like royalty, if only for the night. IDEAL FOR ALL BODY TYPES - Slimming and flattering for all silhouettes, this dress complements body shapes, ranging from rectangle to hourglass. MANY SIZE AND COLOR OPTIONS - Available in the most popular colors and in Size 00- 20. Perfect match any seasonal wedding color scheme while finding the perfect fit for petite, tall, or plus size bridesmaids.